Winter forage crops can fill the gaps in a fodder flow or compensate for other specific challenges or deficits. Japanese radish and all the small grain forage cereals (stooling rye, triticale and oats) fall into this category. PANNAR has oats, triticale and stooling rye cultivars that produce good quality forage in the critical late autumn, winter and spring months. Each of these types has its own application in a fodder flow programme. It is therefore essential to consider the characteristics of each type to use their strengths to the best advantage. The right cultivar choice ensures that sufficient grazing is produced at the right time. Of the three types of crops (oats, triticale and stooling rye) oats is the most palatable for livestock. However, oats is also the most sensitive to cold and if winter temperatures regularly drop below -5ºC, triticale or stooling rye should be more successful. Stooling rye is the most cold tolerant of the crops and withstands temperatures below -15ºC quite well. As with wheat cultivars, forage cereal cultivars are grouped by their growth habit onto spring, intermediate and winter cultivars. 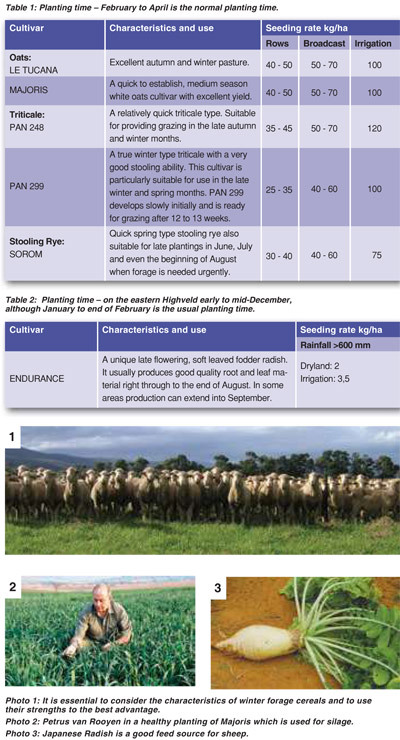 Each of these types has their own application as a forage crop in a fodder flow programme. It is therefore important to consider the characteristics of each type. Japanese radish is probably the most underrated forage crop in South Africa among those who have never planted it before. No other crop uses water and fertiliser as efficiently as Japanese Radish. It is particularly useful where pasture under irrigation is insufficient or absent. This succulent feed source is well adapted to the cooler easterly parts and is used in autumn and winter until early spring. It is not cold or frost sensitive and requires approximately 350 mm rainfall over the four month growing period. Good grazing for cattle and sheep. Dry material is highly digestible. For cattle it is best pulled or ploughed out and fed whole. Avoid chopping into pieces as cattle may choke. A good alternative source of roughage. Article submitted by Peet van der Walt, Advertising Manager, PANNAR SEED (PTY) LTD, South Africa. For more information, send an email to peet.vanderwalt@pannar.co.za..